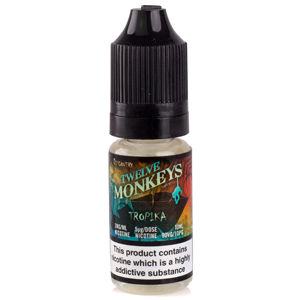 Twelve Monkeys Vapor Co. are a prolific Canadian e-liquid manufacturer who specialise in very sweet Malaysian-style juices. Their quirkily-named liquids are extremely well known in the vaping world and have garnered the company numerous awards including ECig Click’s Best New Brand in 2015 and Best International Brand in 2017, as voted by international vapers. 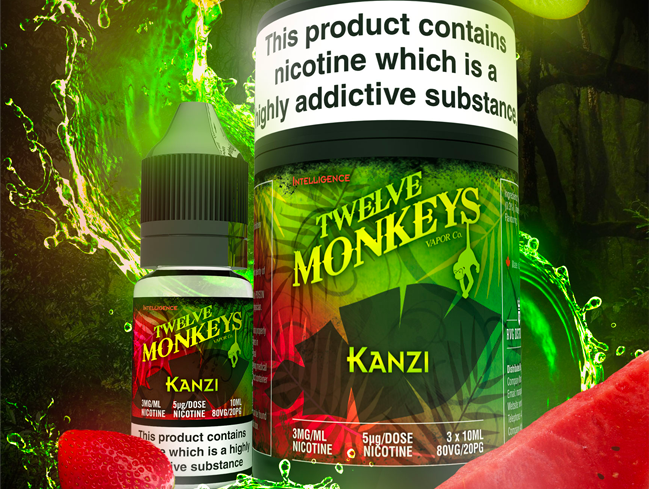 Twelve Monkeys manage to effortlessly combine artisan production with economic pricing, sourcing the finest quality ingredients and subjecting them to vigorous testing in their state-of-the-art production labs. Every bottle is pre-steeped for at least two weeks before sale, which means you won’t have to wait around for full-bodied sub ohm flavour. 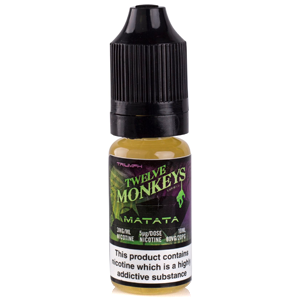 Instead, Twelve Monkeys can be vaped as soon as you open the bottle – so what are you waiting for? Stop monkeying around with flat flavours and underwhelming clouds and grab yourself a bottle of the jungle’s finest! Delicious concoction of tropical fruits. Twelve Monkey’s Origins series was the deserving winner of the 2017 Best International Brand award and is composed of five simple fruit and tobacco flavours. The juices in are available in 65/35 VG/PG ratios making them a great pairing for any sub ohm setup and an ideal option for extending the life of your coils. Patas Pipe features notes of aromatic tobacco with just a hint of sweet vanilla and cocoa, whilst Saimiri caters to those with slightly more exotic tastes with its base of juicy strawberries and subtle coconut cream. Galago is bursting with ripe red grapes and fragrant lychee, and Lemur is the perfect remedy to a hot summers day with its layers of refreshing citrus and cooling menthol. The collection is finished perfectly with the tropical, tangy pure pineapple Papio. 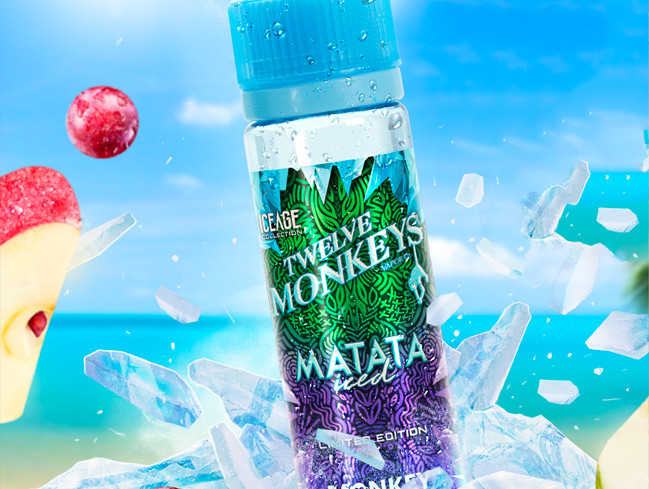 The Ice Age collection is the perfect treat for your tank and your taste buds during hot summer days, with each flavour a refreshing intermingling of fruit and invigorating menthol. Their 75/25 VG/PG ratio make them ideal for massive cloud production luscious, pure flavour, and each variation is available in a generous 50ml shortfill bottle to keep you from losing your cool. Akuna Iced features prominent notes of crisp apple, vibrant cranberry and a cooling wave of menthol, whilst its counterpart Matata (get it?) is equally as icy and crammed full of juicy red grapes. Sabae Iced is a pleasantly-tarte concoction of raspberry, lime and tropical pineapple with a cool exhale, and Nikko Iced can barely contain its notes of luscious watermelon mixed with sparkling lemonade and fresh, crisp menthol. Perhaps the most recognised and adored of all the Twelve Monkeys juices is the now infamous Harambe: a citrusy blend of sharp grapefruit, fresh lemons, succulent guava and blood orange. As well known amongst vapers as the actual Harambe is amongst the rest of the world, this liquid is sweet on the inhale and tangy on the exhale with a different flavour profile emerging with every vape. Delve a bit deeper into the Intelligence collection and you’ll unearth the scintillating Tropika, which was the deserving winner of ECig Click’s Best Fruit Flavour of 2016 award. This juice is bursting with mixed tropical fruits and whilst extremely flavourful, it still manages to be subtle enough to vape all day long, any time of the year. O-Rangz mixes things up a bit with a base of slightly-toasted cereal and comforting milk, with just a touch of lemon to add a little zing. Congo Cream is just as velvety, with an inhale of smooth vanilla custard making way for an exhale of ripe strawberries. 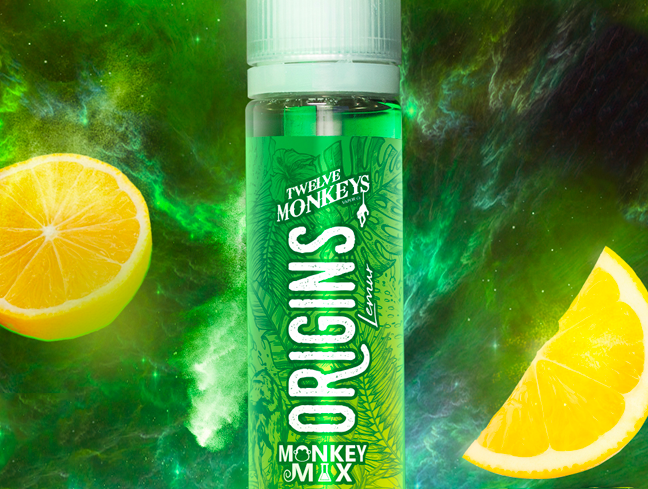 For those seeking a sour vape, look no further, lemon, lime, citrus and sugar blended together. Mangabeys is my all day vape! It is absolutely delicious. Congo Cream - sweet strawberries burst with nice cream flavour - Love it!